TeamViewer’s latest update is the version 9 that brings with it a tabbed view for all open remote connections or chats, data transfer using clipboard, wake-on-LAN and more. Let’s take a look under the hood and see what all it can do. Be it sharing documents, chatting with customers, VOIP or remote access, what makes TeamViewer unique is its endless possibilities. It is more than just a messenger service or a Remote Access Protocol – it makes your online communication easy. You can also do online meetings and it supports up to 25 participants; training sessions and presentations can be done easily. You can access your office computer from home; data and applications can be accessed anytime and from anywhere and much more. With TeamViewer, you can chat with more than a single user, control a computer anywhere in the world remotely and also handle VOIP all at the same time. With each connection displayed in its own tab that blink each time a new development appears, TeamViewer is your answer to multitasking multiple connections. Ever faced a situation where you had to explain a technological or interface related complication to your customer or trying to teach your dad on the phone how to fix something? With TeamViewer 9 you can generate a remote access ID for any computer that has TeamViewer installed on it and control it remotely investigating the issue plaguing the system. Stable and express, this software doesn’t really require a huge bandwidth for remote access. Filebox allows instantaneous file transfer between various computers through remote access. Simply drag and drop the files you wish to share with other users or computers or directly paste them onto a remote computer. With users on TeamViewer that are in your contacts you can choose to chat or perform a VOIP session. The option is available to all including those who use TeamViewer for personal free use. Chat functionality is akin to the usual Gtalk and such apps while VOIP tends to take less bandwidth and is much more clear than on Skype or others. Yes, TeamViewer also brings video chat with a better load time, less hardware intensive process that is sure to please anyone. 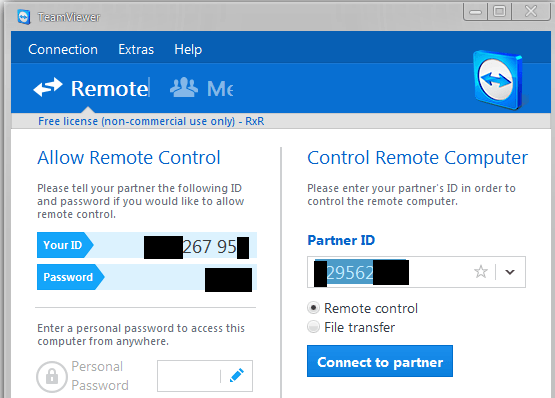 Automatically configuring your connection with the other party taking into consideration both systems, TeamViewer ensures that the connection remains stable and picture quality remains viewable. 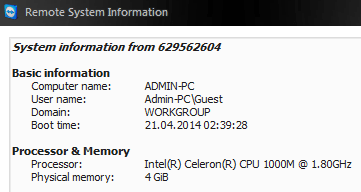 Have a home PC or a server located somewhere in the world? 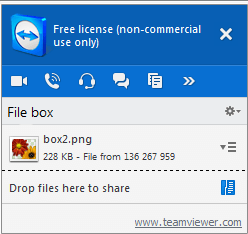 With TeamViewer not only can you control any PC with TeamViewer registered to your account but also share files and download or upload vast amounts of data using FTP. Want to create a tutorial for your employees, father, mother, friend or for whoever? With TeamViewer you can record your session with audio or take screenshots to share with others whenever and wherever they are. TeamViewer can accommodate slow internet connections too. Arrange the interface and viewing option of your app the way you want and get the fastest possible response while engaging with another TeamViewer member, regardless of your mutual connection speed or stability. TeamViewer 9 brings together many useful features that otherwise require a plethora of apps to achieve. From screen sharing, recording, remote desktop control to VOIP and video chat, you get everything in a sweet little package without spending a single penny.